If you need a highly capable and robust system to print top quality cards quickly, take a look at the Evolis Avansia Dual-Sided ID Card Printer with Magnetic Encoder. Printing more than 140 single-sided color cards per hour, the Evolis Avansia Dual-Sided ID Card Printer with Magnetic Encoder is highly productive and ideal for ID cards in medium and large quantities. With a 600 dpi resolution, the Evolis Avansia Dual-Sided ID Card Printer with Magnetic Encoder renders images and text perfectly. Micro text and watermarks are printed in high definition. The Avansia Dual-Sided ID Card Printer with Magnetic Encoder guarantees your edges will print perfectly since the retransfer film fully covers the card. Thanks to Retransfer technology, the Evolis Avansia Dual-Sided ID Card Printer with Magnetic Encoder can print on all types of cards, from PVC and PET to polycarbonate and ABS. This makes the Avansia Dual-Sided ID Card Printer with Magnetic Encoder perfect for cards with uneven surfaces like smart contact and contactless cards. Also, the standard built-in card flattener delivers perfect results. The Evolis Avansia Dual-Sided ID Card Printer with Magnetic Encoder prints more than 140 single-sided color cards per hour, making you exceptionally productive. You can print your ID cards with no interruptions thanks to a high capacity feed tray and output tray that holds 250 cards each. In addition, Evolis has high capacity consumables for the Avansia that cover 500 prints per roll. 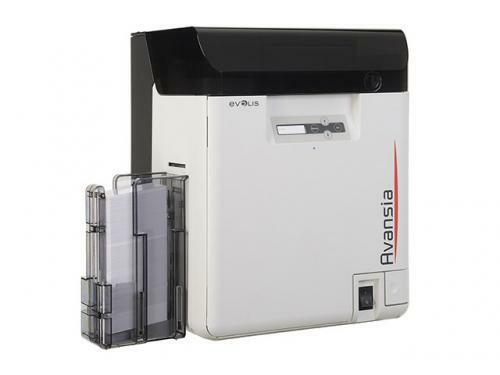 You can store up to 250 blank cards in a removable card case inside the Evolis Avansia Dual-Sided ID Card Printer with Magnetic Encoder. And for your convenience when operating, a front control panel has 4 keys, a 2-line LCD display, and a status indicator. For security, the Evolis Avansia Dual-Sided ID Card Printer with Magnetic Encoder comes with an electronic key that allows ribbon recognition, secures the use of the printer, and monitors consumables status. To help you meet your specific needs, the Evolis Avansia Dual-Sided ID Card Printer comes with a magnetic stripe encoder (ISO 7811). In addition, optional contact and contactless smart card encoders can be installed on site. To maximize the quality and durability of printed cards, the lifespan of the print head and the overall printer reliability, use Evolis High Trust� ribbons. The Evolis Avansia Dual Sided ID Card Printer with Magnetic Encoder features a 3-year warranty on printer and lifetime warranty on printhead.